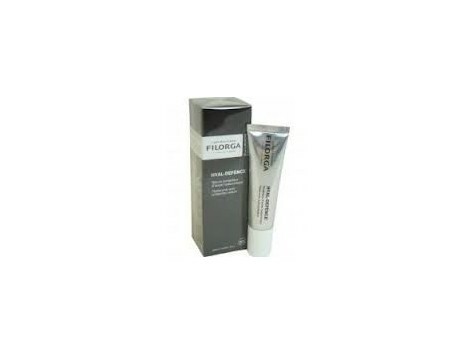 Filorga 30ml serum Hyal-Defence Serum hyaluronic acid comprehensive protector. Serum redensifying and moisturizing, anti-pollution shield. PROTECTS SKIN YOUTH CAPITAL OF PRESERVING hyaluronic acid present in the dermis contains: - NCTF ® and hyaluronic acid, polirevitalizantes. - Extract Centaurea which prevents degradation of hyaluronic acid by hyaluronidase. - Cocktail anti-oxidant, anti-free radicals. - Stimulhyal ®, redensifying active sugar derivative, promotes the synthesis of hyaluronic acid and elastin fibers. Better protected, the skin is more luminous, SOFT redensified USE: Apply as daily treatment, morning and night, before the day cream and / or night. Also as a treatment in rest periods mesotherapy injections to amplify and prolong and optimize its effects.